To be honest, even with the amount raised I'm skeptical of the quality of that bag. That was part of what went into my decision to stay short of that point. Looking at OP's data, there're around eight thousand people who will be getting these bags. Even if they can get away with $25, that's $200,000 just on fulfilling that tier (and higher, bag included) of reward. Ohh after bungling around with trying to figure what's up with your link and making a couple errors, it's just that you got text and URL backwards. The problem with saying you're pro-life (especially on a sub like this) is there is a lot of stuff attached to it. Because extreme pro-lifers do believe that every pregnant woman should have to see the pregnancy through, and that abortion is murder, but then offer zero support once the child is actually born. Not saying everyone who claims pro-life is like that, just that the ones who are are very vocal about it. For me, even more extreme is the approximately zero politicians (at least on the national or my state's stage) who are both pro-life and also in favor of things like support for family planning services or requiring health insurers to cover contraception. Consider how tearing down the ACA is one of the big tenets of the GOP platform, and how they're not saying "the requirement to cover birth control is a great one and we'll keep it in what we replace it with" but the exact opposite (supporting lawsuits like Hobby Lobby). Edit: Also in terms of providing medical care and otherwise supporting pregnant women who do carry to term. Honestly, I think that would run the risk of a counterproductive selection down. For example, suppose pins was at the $100 level and dice and Trinket were shifted up. I suspect that a lot of people would have said "well I'd like the dice but not enough to add another $100, and I don't really care about the pins at $100, so I'll go with $50 (or even lower)". Ditto with $200 -- I pledged trinket plushie dollars, but had pins been $200 and Trinket $300, there's a very good chance I'd have gone with the $100 dice level instead. I wonder if part of the reward structure is the cost of the messenger bag. I was going to say that it actually might have worked better going the other way (flopping the $300 and $400 levels) because they probably would have picked up a ton of $300 pledges because of the bag (I would have jumped for that in all likelihood), very possibly more than the $400 pledges that would have dropped to $300. But then I was thinking about it and those trades aren't equal -- moving up from $200 to $300 to get the bag would have only gotten them $100 minus the price of the bag, while loosing a $400 pledge would have lost them $100 minus the price of the pins. I can't imagine that the pins cost anywhere near the bag, so that could be a pretty significant price differential. If so, then maybe the underwhelming $300 tier was to make up for the potentially-fairly-high rewards cost of the $400 tier. There is a certain amount of display and interface needed to support configuring charging times and displaying consumption on previous trips. That said, I now consider it a pretty gave omission. Some of this is because I have a PHEV with a small battery that I don't trust the BMS very much and so I feel like I have to micromanage a fair bit (e.g. try to stay away from 100% charge), but I "have to" put a fair bit of effort into things like avoiding to charge to 100%. Maybe sometime I'll get a JuiceBox charger, which will cap charges externally -- but then that requires reporting the current battery % when you plug in. I don't know an absolute number -- but I have heard many times that gas provides extremely thin margins and that they really depend on making a lot of sales from an attached store or something else (car wash, etc.). I wouldn't be at all surprised if less than 5¢ in even moderately competitive markets is pretty common. Edit: this quora page has someone saying "a few pennies" and another saying 5-15 cents; this one has someone saying 2-4 cents and another saying 3-6, one saying anywhere from a few cents to 25; this article, citing the National Association of Convenience Stores, says 3 cents if you take into account credit card fees; this article says about 23 cents. So answers vary a lot, but most seem to be under 10 cents. I wonder if PODS-style things (UHaul has one of these as well) would be a practical price for an in-town move. Something to check into. I wish the redditgifts for teachers thing they used to do was still around (in the pre-Donor's Choose form they tried in 2016). I think my favorite fact (I've posted this in another thread I think) is that, per KickTraq, on the campaign's worst day they made $39,613 (March 24). Had they managed to raise just that paltry sum on every day of the campaign, they'd have still come away with... $1,782,585 (enough to meet the first two stretch goals and get the second episode). FYI, that may not matter. I have to speak in generalities because I don't know your situation. There are two kinds of dependents. They could be called "type 1" and "type 2" dependents, but instead the IRS uses the terms "qualifying child" and "qualifying relative"; the point is don't put too much stock in the names, for example children can potentially be either kind of dependent to their parents (so you could be a "qualifying relative" to your parents but not a "qualifying child"). His support matters for qualifying relative, but it doesn't matter for qualifying child. What matters for q.c. is whether you pay at least half of your own support; but if someone else (mom) is paying the majority of your support than he still passes the support test for q.c. I was referring to the OP owing more money. I'm not sure what you mean by that. My point was just that I don't see why bringing up the EIC wasn't a red herring. I'm not sure why this guy is talking about the son's tax liability. Except I think your suggestion (the parts of it that I was responding to) complicates things, or at least makes them more error prone and likely to cause even further delays, rather than simplifying. Because now you're giving the IRS another possibility to make an error in processing your mailing if it tries to process everything as one return (or worse) and needs human review. And you get that because you're trying to solve a problem that doesn't exist. I'm not saying the son shouldn't amend (he absolutely should), I'm saying that (i) OP's return and the son's return should be mailed separately (these-things-happen agreeing with that point basically confirms enough for me that combining returns in the same envelope is a bad idea) at the cost of a second envelope and postage, and (ii) there's no need to worry about processing order. This comment is pretty old and I'm just seeing it now, but the Subaru Crosstrek Hybrid will be a second. That said, I don't really expect it to make any top 10 lists. :-) But who knows, I could be wrong. I'd make this dumb kid pay me for the extra taxes. There's no need for that, because OP's "dumb" kid (I use those scare quotes very sarcastically) can correct their return pretty simply and, as you point out, likely with no actual tax consequence. There has to be more to this story. You not understanding what happened? Because this is 100% bog standard, expected, actually pretty common, and easy to resolve (if a little annoying). Whether you are a dependent and who your dependents are sill affects.. I dunno, maybe even dozens of different credits and deductions. So there's still a box that says "someone else can claim me as a dependent" that OP's son should have checked but didn't. Failing to check that box almost certainly doesn't affect the son's liability, because of the standard deduction. That would wipe out the son's income regardless of whether that box was checked. The IRS will need to process the amendment on your son's return before they can process your return. That contradicts basically everything I've seen people say here and on /r/personalfinance. The process as I've always seen it described is that e-file for the second person is rejected, and they must paper file. However, that paper file is processed like a normal paper return. The conflict between the two (if OP's son never amends) is only discovered late in the year, at which point the IRS would send both parties a letter. It also makes sense to have it this way, so that someone filing incorrectly but first can not just completely block, or even significantly stall (paper vs e-file is slower, but nothing beyond that) the processing of the person's return who should claim the person. It doesn't know how much he bought them for or when. I can imagine that the IRS might deliberately make the choice to assume a zero basis in order to... "encourage" the person to handle things correctly. For example, because there could be basis adjustments, maybe the IRS thinks that if they just use the information provided the taxpayer will probably just go "yeah whatever" even if it's wrong, but if they assume a $0 basis than the taxpayer will be more likely to do things correctly. However, for covered shares -- and OPs are covered -- your statement is... I don't want to say wrong, but it's wrong in many cases at least. The IRS does know that information, at least to far more accuracy than $0; it's reported right on a 1099-B. If the IRS wanted to have their proposed assessments be more accurate as opposed to have some side goal like the above, they should use that number. A thought I didn't adequately express is that I don't think that the lack of a definition of how good the autonomous system must be at the things it purports to do is a weakness of the SAE definitions, because it means it's flexible -- it means that a level 5 system (or whatever level) is one that is fully autonomous with whatever safety criteria we wish to set by policy. Maybe that's "it needs to be as safe as an average human driver", in which case handling the dynamic driving experience means doing so with a safety at least as good as a human driver. Maybe "we" decide as policy (through our legislators and regulators) that we're willing to give up a tiny bit of safety for the increased convenience of autonomy. Maybe we decide that we want stricter standards. To me, this is an orthogonal question to the SAE levels. Said another way, I think you're just restating that there's a third axis to the overall picture. But again, one of those axes is still the SAE levels. SAE's taxonomy is incomplete, it's not misguided or useless or only for academics. Your grandmother might be considered fully autonomous but she might not want to drive at night or in heavy rain. So I can think of two angles you might be coming at this at, and I think I've got a response to both. The first is what happens if "at night" or "in heavy rain" are hard limits to the autonomous system; in other words, those are situations it detects and requires the user to take over for. (This would be applicable to level 4 and below.) That to me is just another part of the axis about how broadly applicable the driving system is. And while it's true that the SAE system doesn't touch on that axis, I think saying "it's only one of two major axes" is a lot different from "it's not useful and just for academics." If you're coming at it from the angle of a system that tries to operate in those conditions but does it poorly, I think that falls into the safety axis. And partially because of that anchoring fallacy and partly because I think it does to an extent reflect how things should be, what that tells me is just that the system is misrated. So if it's purportedly a level 5 system for example but is worse in those conditions than an average driver, it really shouldn't be considered a level 5 system and really the system should incorporate mechanisms to detect those conditions and fall back to the user (meaning it'd be level 4) to drive in them. Again, that's not the SAE's taxonomy breaking down, that's the car manufacturer or whatever misrepresenting where there system falls within than taxonomy. FWIW, I think the SAE definitions are incomplete (in another way that I'll get to in a second), but I still think you're being too harsh. I think it's still quite useful to think about what the levels mean for the driver. So for example, consider your example of how well it does its task. To an extent it's defining something, I think it's pretty reasonable to say that a hypothetical autonomous system has reached the point where you can legitimately classify it at a certain level when it can drive autonomously with a similar skill level as an average driver. In other words, if I let the car drive me around (admittedly maybe this only makes sense at L3 and above), I should be no more likely to get into an accident than if I were driving from a statistical standpoint, and any accidents that I do have shouldn't be more severe. But I also think that you can look at it as a description of how you can treat the autonomous system, and here's where I think it really starts to shine. A level 3 system means that while it is engaged (I'll get to that caveat later), I can do stuff that's not driving the car -- I could surf the web, I could watch a movie, I could do work, I could read a book. A level 4 system means that I can nap. You probably need at least very close to level 5 to make it so I can forgo car ownership altogether and take autonomous taxis everywhere. Those are all real differences, and I think the SAE levels reflect a true reality of differing capabilities between those systems. I also don't see much in the way of bright lines between them (as opposed to when the systems are engaged, see below), so I don't think that finer levels would be very useful. and I 100% agree with that (and will talk more in a sec), but I want to highlight that's not a very discerning definition either. What does it mean drive you to and from work? What can you do in the time? Do you have to pay attention but the car is doing most of the driving for you (L2), or can you do other stuff as discussed above (L3 or 4), or does it just not need you at all (L5)? Maybe said another way, I see the SAE's levels as looking at things from the driver's perspective rather than the car's perspective or the manufacturer's perspective. Where I see the big shortcoming is that caveat when the system is engaged. Just for a thought experiment, consider two ridiculous restrictions. Consider a car that can drive autonomously at level 4, but is geofenced to streets named "George Blvd." That... OK, that'd be awesome while you're on George Blvd, but otherwise that's not a very useful feature, is it? Contrast with a system that can operate at level 3 basically anywhere, but requires you take over if it sees an emergency vehicle with its lights on. Like that's obviously waaay more useful even though it's a level lower in the SAE taxonomy. I kind of view the utility as forming a 2-D grid. On one axis are the SAE levels that tell you what you can do while the system is active, and on the other axis is a spectrum of how broad the scenarios are where the system can be active. Most of that grid is possible; it's just the level 5 row where "in any situation" is the only possible choice for when the system is active. What I see you're saying is that there's a Z-axis that describes how well the car does its driving. 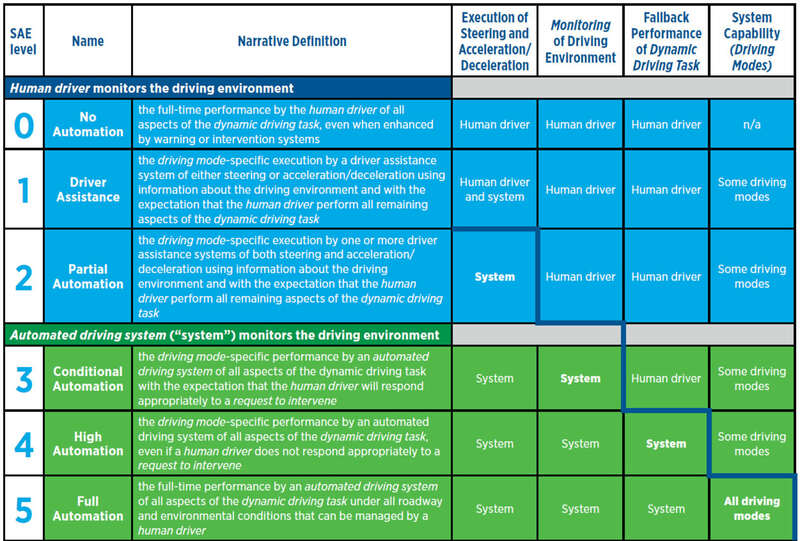 That's true, though I personally find the other axes more compelling -- if the system does much worse than a human driver I think it might as well not exist because I'd just drive, and there's good chance I'd rather see a broadening of situations where you can apply autonomous driving and/or an increase in the SAE level of autonomy rather than improvements to safety. However, I'll admit that judgement is probably heavily borne out of an anchoring fallacy that an autonomous system should aim to match human drivers (rather than beat it by a wide margin) and once you get there then it's "good enough" for the time being, until the other aspects are improved. Level 1,2&3 the drive is responsible. Level 4&5 the car )or its manufacturer) is responsible. I don't work in the field, but seeing a number of questions like this here and on /r/personalfinace, it seems like the IRS ignores the reported basis when producing a kind of substitute return like this. (I don't know if this is formally a substitute return; probably not, but I don't know what to call it.) In other words, they have the information, but for one reason or another (probably largely because they're chronically underfunded) they don't use it. It is looking like there's a very good chance they'll raise more money today than their original $750K goal. Today is at $677K, and they're currently pulling in something like $60K/hr. Edit: Kicktraq split the last 24 hours across two days, so they didn't make it; $652K on what it counts as 4/18 and $299K on 4/19. But the last 24 hours virtually certainly made it. What's insane is that they've passed $11 million and still have four hours left. They've done more than a half million today, and I think most of that in the last few hours. Over the last couple hours they've averaged a new pledge every five seconds.